Eastern Mindanao Command has released a photograph group of the three men kidnapped by what authorities now suspect may be the work of the New Peoples Army (NPA). Both John Ridsdel and Robert Hall are Canadians – while Kjartan Sekkingstad is from Norway. Igacos Mayor, Aniano Antalan – quoted the note to the media in Samal. Authorities now say that at least 30 foreigners were present in the marina when the kidnapping took place. 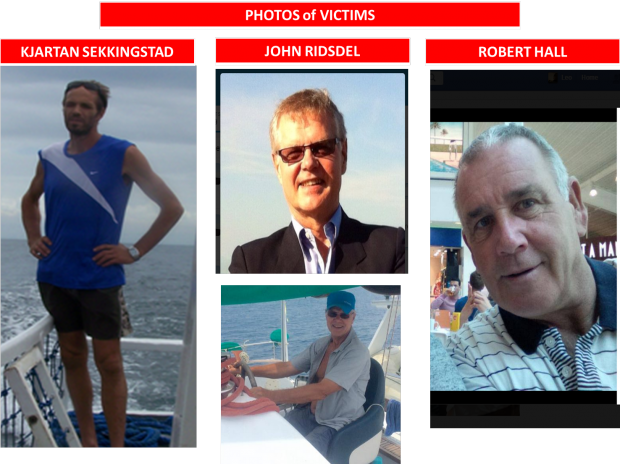 Reports say the gunmen were speaking English and Tagalog while forcibly removing their victims from their boat. The Canadians are an exec and geologist from TVI Resources operating the Canatuan Mine in Zamboanga. Targeted hit.